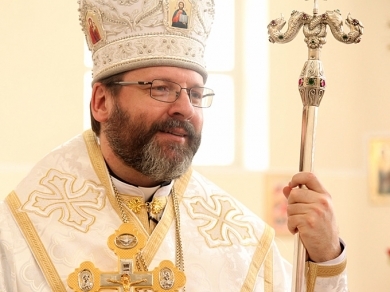 Pope Francis calls Havana Joint Declaration debatable, understands Ukrainians might feel betrayed While the Department of External Church relations of the Moscow Patriarchate spins the meeting between Francis and Patriarch Kirill, the Pope expresses support for His Beatitude Sviatoslav. Francis and Kirill: Who Played Whom? Five details from yesterday's historical meeting suggest that while the Russian Patriarch may have thought he was first violin, the Jesuit Pope was conducting the orchestra. Communique from the joint meeting of the bishops of the Greek-Catholic and the Roman-Catholic Church in Ukraine Beloved in Christ Brothers and Sisters! From 10 to 13 November of this year Ukrainian Catholic bishops of two rites gathered at the annual recollections, which took place at the Higher metropolitan seminary of the Latin rite in Bryukhovychi near Lviv. UGCC has organized an exhibition that highlights the daily life of the Jewish people In the Institute of Religious Sciences of St. Thomas Aquinas in Kyiv the exhibition "The people of the book " was opened.